On watching a little of the videos, of her running in a darkened shopping mall with nobody to chat to, I've become impressed with the effort she put in. She is supporting herself on the handles at times, which I presume is against the rules but those handles must be so tempting when you are dog tired. I see lots of runners leaning on those handles in gyms. The simple math of 4 mph for 19 hours per day is where they went wrong. Laz will tell you that multi-day ultra running doesn't work like that. There is wear and tear and it's a difficult task to keep moving for that length of time. I'd say Dave did the maths and encouraged Amy that it would be no harder than sitting in a tub of baked beans as someone said earlier and that's how the challenge started. Then on the first day Amy only covered 60 miles and the math started looking shaky. There was too much invested in social media, sponsors etc to fail (think Skins and Rob Young) so the multiple quick 10k efforts happened late in the week. In many gyms, over 50% of treadmillers use the handrails. Should I hang on to the treadmill? "Should I hang on to the treadmill or not?" "If you are walking on the treadmill, we've achieved my goal for the day. Hang on or don't hang on. It's the same difference to me." You are on the treadmill to improve cardiovascular function, to boost serotonin levels, to lower your risk of some of our most nasty chronic diseases and to just plain feel better about yourself. Honestly, I can't believe the Amy haters are even bringing up this picayune fact. In a mammoth 521 mile week-long record breaking effort, obviously safety is of primary import. If your safety is in question, hold on the the handles as needed. Use the safety strap so you don't get seriously injured. Amy & Dave's shills (or even Amy & Dave themselves) are now posting things to say cheating by holding onto the treadmill bars is okay. Or you could quote the LRC thread. Not me..... wrote:Nice dodge when the anti-Amy data is revealed as faked. he faked Amys own live stream footage? the only thing left to figure out now is what other ways, if any, that Amy and Dave have been deceiving people because its clear for all to see that she did not run the distance they claim. she's not just holding the handles. she's using them to partly suspend herself and take weight off her legs. if safety is her concern then why hang on for 20 seconds or more. surely slowing the treadmill is the safer, sensible option. if you're holding on that long for 'safety' then you obviously cant run at that pace. Nope, just someone who doesn't think the above examples are that damning. I don't think she legitimately broke the record, but an occasional propping of herself didn't get her to that mark. Keep at it though, I do truly enjoy a good "outing". If Amy wants to hold onto the treadmill while running that is absolutely fine. If she also wants to step off the treadmill while it continues to clock up miles that is also fine. You lot don't know what you're talking about. Probably next to you can't step off the treadmill leaving the belt running, these are pretty obvious conditions. Considering that most treadmill users grab the handles when in use, I'd say it's "pretty obvious" that it should be allowed. 2) The treadmill should have a handle bar across the front. When you change settings, you need the stability that the bar offers. In an interview with Suzi Chan, who got a treadmill record it was stated that she was forbidden from holding onto the treadmill or else the attempt would be void. I think it was in the Marathon Talk podcast. Will I get a better workout if I use the moving handles on the EFX and AMT? Using the moving handles during a training session can provide a variety of workout advantages. Passively holding the handles gently activates your upper body and facilitates a total body workout, leading to a slight increase in caloric expenditure. It also naturally synchronizes the movement between your upper and lower body. However, for more significant results, exercisers should actively push and pull on the handles during the training sessions. Doing so will not only elevate calorie burn, but will also engage the core muscles. Only 1 in 4 of the users is NOT using the handles. Only on the self-worshipping LRC would this be considered a proof of anything. Maybe it was forbidden in *her* record attempt. But there's no evidence that it was prohibited in Amy's 521 mile record. 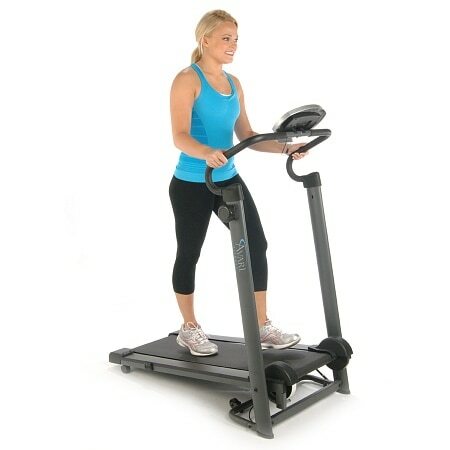 Most pictures of treadmills in advertising literature show the person using the handles. This is like claiming I can hold on to a pace car during a race and this would be fine.